Should Christians Follow Marie Kondo's Advice on keeping books only for joy? Have you watched the new Netflix series with Marie Kondo, a Japanese woman who helps people Tidy Up their homes? Or have you read her book? I believe this is the book: The Life-Changing Magic of Tidying Up. I've not read her book, but I have watched a little of Tidy Up on Netflix. I had heard of her in several different writer and productivity groups, all positive, so I decided to give it a try. I didn't even finish the first episode, because I was so annoyed at the agenda being propagated. 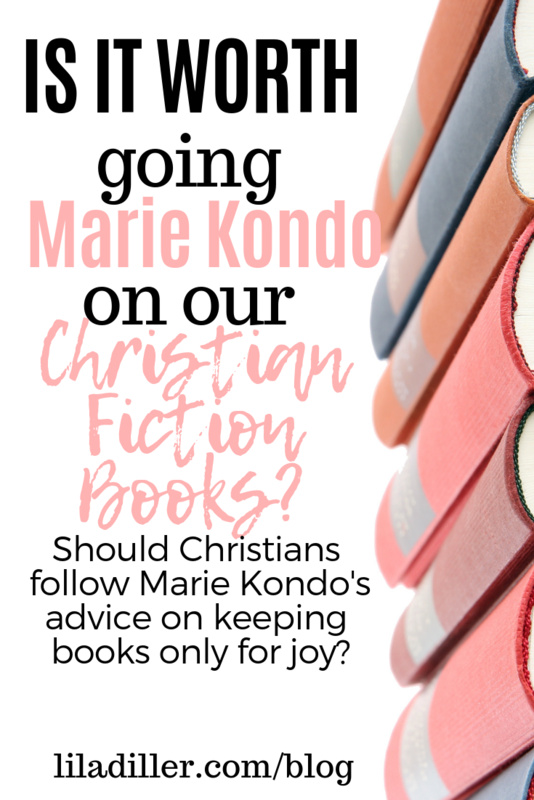 Should Christians follow Marie Kondo’s advice on keeping books only for joy? www.liladiller.com/blog/marie-kondo-book-decluttering-response. It wasn't until after I watched it that I started hearing about a big debate going on in reading and writing communities about her approach to getting rid of books. She taps each book to “wake it up” and to give clarity to the owners on whether it brings joy to them. If a book doesn’t impart joy, the owners should verbally thank each book and get rid of it. Then I read this article completely bashing Marie Kondo and her advice to get rid of books. Please read this article first to understand my reaction. What's your first gut-reaction to this article? Do you agree or disagree? Here are three lessons we can take from this debate and apply to our lives as Christians. Be careful what you accept. Marie Kondo is all about, like this article said, "woo-woo nonsense." It's a philosophy stemming from a spiritual, Eastern mysticism that borders on pantheism, the idea that every bit of matter, even an inanimate object like a book, has the essence of god, something of a consciousness. I obviously don't subscribe to this philosophy or the practices that stem from it. Waking up a book is impractical and merely wastes time. Waking up a book puts the focus on the creation rather than the author, easy to worship the creation rather than the Creator (Romans 1:23). Avoiding one philosophy shouldn't lead to the opposite; don't swing to the other extreme. It's the age-old illustration of the pendulum. When it swings to the far right, people react and swing as far away from it as possible, to the extreme left. Our goal is not to get as far away from pantheism as possible. Our goal is to find balance, accept the truth from wherever it's found (as long as it's truly true). While I don't agree that books have consciousness, I do agree with Marie Kondo, however, that we can release the extra stuff we don't need or want. I don't think we're required to keep books that we hate, as the author of this article, Anakana Schofield, says. A poorly written book, or one that propagates a philosophy I don't agree with, has served its purpose. I've learned how not to write or why I believe what I believe. So let's not throw out the kernel of truth that books can be gotten rid of, just because it comes from someone we disagree with. What about books that don't necessarily bring me joy but serve a purpose? I sometimes keep books that made me think or about a topic I want to research deeper because I don't know if I agree. Otherwise, I can move them out to make room for more books, more new ideas and more risks on new-to-me authors. Unlike ebooks or audiobooks, there is a limit to how many books will fit on my bookshelves. I already have stacks of unread books on the floor. The clutter can become enough to stifle creativity. And my mission is more important than keeping every book just on the principle that Marie Kondo said not to. I don't care if someone wants to get rid of books. Passing them on to someone else who could benefit from them or like them more is a great byproduct of cleansing and decluttering. It's like in our walk with the Lord. Sometimes we've learned a lesson but we're no longer in that phase of life, like in parenting. We can pass on our lesson to those with younger kids, and then we can move on and not to have to keep revisiting that lesson. We can learn from this debate. We can take the principles of decluttering and use them in our spiritual walks. We need to be careful of practices stemming from unbiblical philosophies, but that doesn't mean we need to throw out every kernel of truth. We need to be discerning in this messy middle, knowing when to keep things and ideas and when to discard them. Our guide is the Word of God, the only Truth. What's your opinion about this article? Do you think giving away books is a travesty? Why? Comment below.